In May 1983, Jim was back in Washington to help celebrate Bob Hope’s 80th birthday at the Kennedy Center. Once again benefiting the U.S.O. (Hope was a longtime supporter,) Jim was happy to join the festivities. The show started with a pre-taped conversation between Hope and then-President Ronald Reagan (an old buddy from his Hollywood days) and then launched into a big musical number featuring Wonder Woman star Lynda Carter, the Armed Services bands, and eight dancers. In recognition of Hope’s star power, the special clocked in at three hours and included a huge array of popular talent. These ranged from Tom Sellack and Flip Wilson to Howard Cosell and a couple boxers (Marvelous Marvin Hagler and Sugar Ray Leonard in a musical number!). Several Muppet Show hosts, beyond Hope and Carter, appeared including Loretta Lynn, George Burns, Phyllis Diller, Dudley Moore, and Brooke Shields. Underlining Hope’s strong connections, superstars Lucille Ball and Frank Sinatra joined the party. And to top it off, Kermit did a comic bit and sang a duet with popular Scottish singer Sheena Easton, a customized version of “Just The Way You Are”. The special aired on NBC on May 23rd. Jim and The Muppets had worked with Bob Hope many times in the preceding years including on a baseball themed special for the 75th anniversary of the World Series. 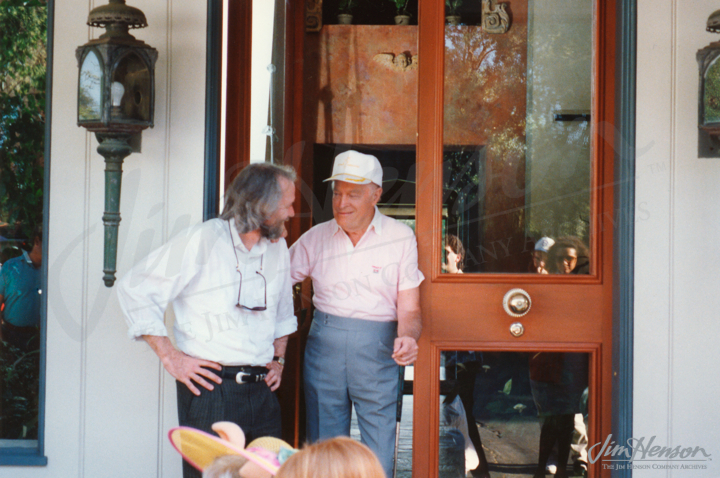 Learn more about Jim’s work with Bob Hope. Jim and Bob Hope in the 1980s. This entry was posted in 05-May '83, 1983 and tagged Bob Hope, Kennedy Center, Lynda Carter. Bookmark the permalink.